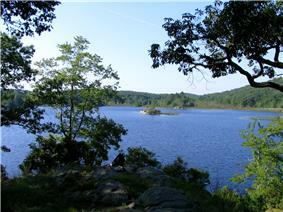 Island Pond in Harriman State Park, near the Village of Harriman. 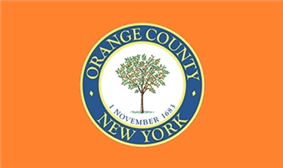 Orange County is a county located in the U.S. state of New York. As of the 2010 census, the population was 372,813. The county seat is Goshen. The county was named in honor of William III of Orange, who was greatly esteemed by the English settlers of the region. Orange County is included in the New York metropolitan area. It is in the state's Mid-Hudson Region of the Hudson Valley. The County Executive is Steve Neuhaus. 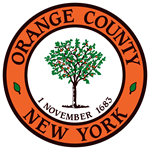 Orange County was one of the first twelve counties established by the Province of New York in 1683. 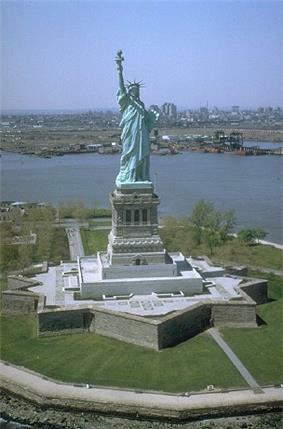 Its boundaries at that time included present-day Rockland County, which split from Orange County in 1798 following the American Revolutionary War. Due to its small population, the original Orange County was not fully independent and shared government functions with other counties. The first public buildings were erected in Orangetown in 1703, and the first court was established in 1801. Due to a boundary dispute between New York and New Jersey, the extent of many of the southern towns of the county was not established until the 19th century. Orange County is in southeastern New York State, directly north of the New Jersey-New York border, west of the Hudson River, east of the Delaware River and northwest of New York City. It borders the New York counties of Dutchess, Putnam, Rockland, Sullivan, Ulster, and Westchester, as well as Passaic and Sussex counties in New Jersey and Pike County in Pennsylvania. Orange County is the only county in New York State which borders both the Hudson and Delaware Rivers. Orange County is where the Great Valley of the Appalachians finally opens up and ends. The western corner is set off by the Shawangunk Ridge. The area along the Rockland County border (within Harriman and Bear Mountain state parks) and south of Newburgh is part of the Hudson Highlands. 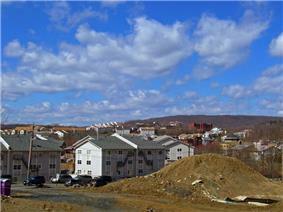 The land in between is the valley of the Wallkill River. In the southern portion of the county the Wallkill valley expands into a wide glacial lake bed known as the Black Dirt Region for its fertility. The highest point is Schunemunk Mountain, at 1,664 feet (507 m) above sea level. The lowest is sea level along the Hudson. According to the U.S. Census Bureau, the county has a total area of 839 square miles (2,170 km2), with 816 square miles (2,110 km2) as land and 22 square miles (57 km2) as water. As of the census of 2000, there were 341,367 people, 114,788 households, and 84,483 families residing in the county. The population density was 418 people per square mile (161/km²). There were 122,754 housing units at an average density of 150 per square mile (58/km²). The racial makeup of the county was 83.70% White, 8.09% Black or African American, 0.35% Native American, 1.51% Asian, 0.04% Pacific Islander, 4.09% from other races, and 2.23% from two or more races. 11.64% of the population were Hispanic or Latino of any race. 18.3% were of Italian, 17.4% Irish, 10.2% German and 5.0% Polish ancestry according to the 2000 census. 9.23% reported speaking Spanish at home, 3.29% Yiddish, and 1.20% Italian. By 2005, census estimates placed Orange County's non-Hispanic white population at 72.4%. African Americans were now 10.2% of the population. Native Americans were at 0.4%, a change that was less than can be measured by the precision of the 2005 estimates being used for these figures. Asians were up to 2.2% of the population. Latinos had however made the largest gain as an increase in their percentage of the population, and now constituted 14.9% of the county's population. There were 114,788 households out of which 39.60% had children under the age of 18 living with them, 57.90% were married couples living together, 11.40% had a female householder with no husband present, and 26.40% were non-families. 21.50% of all households were made up of individuals and 8.50% had someone living alone who was 65 years of age or older. The average household size was 2.85 and the average family size was 3.35. In the county the population was spread out with 29.00% under the age of 18, 8.70% from 18 to 24, 30.00% from 25 to 44, 21.90% from 45 to 64, and 10.30% who were 65 years of age or older. The median age was 35 years. For every 100 females there were 100.30 males. For every 100 females age 18 and over, there were 97.50 males. The median income for a household in the county was $52,058, and the median income for a family was $60,355. Males had a median income of $42,363 versus $30,821 for females. 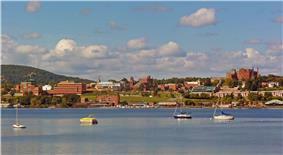 The per capita income for the county was $21,597. About 7.60% of families and 10.50% of the population were below the poverty line, including 14.80% of those under age 18 and 8.00% of those age 65 or over. Despite its rural roots, Orange County has been among the fastest growing regions within the New York City Metropolitan Area. Originally, like most New York counties, Orange County was governed by a 37 member Board of Supervisors consisting of the 20 town supervisors, 9 city supervisors elected from the 9 wards of the City of Newburgh and four each elected from the wards of the Cities of Middletown and Port Jervis. In 1968, the board adopted a county charter and a reapportionment plan that created the county legislature and executive. The first county executive and legislature were elected in November, 1969 and took office on January 1, 1970. Today, Orange County is still governed by the same charter calling for an elected county executive and a 21 member county legislature elected from 21 single member districts. There are also several state constitutional positions including a Sheriff, County Clerk and District Attorney. Prior to 1 January 2008 four coroners were also elected; however, on that date, the county switched to a medical examiner system. The County Legislature and its previous board of supervisors were long dominated by the Republican Party. However, in past years the Democrats have closed the gap. During 2008 and 2009 the legislature was evenly split between 10 Republicans, 10 Democrats and 1 Independence Party member. In 2009, the legislature had its first Democratic chairman elected when one member of the Republican caucus voted alongside the 10 Democratic members to elect Roxanne Donnery (D)-Highlands/Woodbury to the post. However, at the November 2009 election several Democratic incumbents were defeated. As of the convening of the current legislature on January 1, 2012 there are 12 Republicans, 8 Democrats and 1 Independence member. The county is served by Stewart International Airport, located two miles west of Newburgh, New York. The airport serves Delta Air Lines, JetBlue Airways, Northwest Airlines, and US Airways. AirTran Airways stopped providing service to the airport in late 2008. 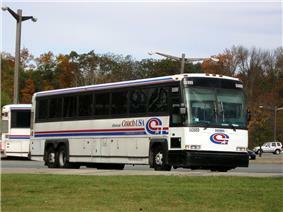 Ground transportation within Orange County is provided primarily by New Jersey Transit, Short Line Bus, and Metro-North Railroad's Port Jervis Line, as well as amenities such as senior citizen bussing and car services, which usually restrict themselves to their respective town or city. The Port Jervis Line experienced major damage from Tropical Storm Irene in August 2011. As a result, train service was suspended for north of Suffern. now operational as of 12/02/2011. The Metropolitan Transportation Authority (MTA) has contracted an engineering firm to assess the damage and determine a plan to repair damaged track beds. In the meantime, the MTA is running 55 buses from 8 stations 24 hours a day 7 days a week to supplement the lost train service. The MTA has pledged to continue the buses until the trackbeds are repaired and the trains run again. In 1970, the county switched from government by a Board of Supervisors consisting of the elected heads of town governments to having a 21-member elected county legislature and executive. The sheriff, district attorney and county clerk have always been elected. All serve four-year terms, with elections in the year following presidential election years, save the sheriff, whose election is the following year. The current county executive is Steven Neuhaus, former town supervisor for Chester. Frank Phillips, Donna Benson and Carl DuBois are the incumbent district attorney, clerk and sheriff respectively. All are Republicans, and the legislature currently has a 13–8 Republican majority. Only one Democrat, Mary McPhillips, has served as county executive. She failed to win re-election after a single term in the early 1990s. For several years in the late 2000s, one Republican legislator's decision to become an independent and caucus with the Democrats led to a 10-10-1 effective Democratic majority, with Roxanne Donnery as chair. The Republicans regained their majority in the 2009 elections. 2004 reflecting a solid Republican edge in county politics. However, Barack Obama carried the county by a 51% margin four years later. It was the first time a Democrat had carried Orange County on his initial election to the presidency. That year the amount of registered Democrats in the county also exceeded Republicans for the first time. The two presidential election results give the county a Cook PVI of R+2, consistent with county voters' willingness to sometimes elect Democrats, such as U.S. Rep. John Hall. From 2007 on, when Hall represented the 19th district, which covers most of the county, Orange's representation in Congress was exclusively Democratic as Maurice Hinchey has represented the towns of Crawford, Montgomery and Newburgh and the city of Newburgh, all of which are in the 22nd district, since 1988. At the state level, Republicans have continued to hold onto Senate seats while Democrats have made inroads in recent years on the Assembly side. Two State Senate districts—the 39th, held by Bill Larkin and 42nd, held by John Bonacic—cover the county. Democrats have made significant gains in the county's State Assembly seats. The 98th district, which includes the far western part of the county as well as the Town of Warwick, is represented by Annie Rabbitt, and the 101st district, which includes the Towns of Crawford and Montgomery, is held by Claudia Tenney, both Republicans. The remainder of the county's Assembly districts are represented by Democrats: James Skoufis in the 99th district, Aileen Gunther in the 100th district, and Frank Skartados in the 104th district. Skoufis is the youngest New York State legislator currently serving. There are many hamlets (unincorporated communities) in Orange County. See the town listings. Points of interest in Orange County include the United States Military Academy at West Point; Brotherhood Winery, America's oldest winery, in Washingtonville; the birthplace of William H. Seward in Florida; the home and birthplace of Velveeta and Liederkranz Cheese in Monroe; the Harness Racing Museum & Hall of Fame in Goshen; the Times Herald-Record newspaper, the first cold press offset daily in the country, in Middletown; the Galleria at Crystal Run, in Wallkill; the Woodbury Common Premium Outlets in Monroe; and the Orange County Fair in Wallkill. The only state parks include Goosepond Mountain State Park, Harriman State Park and Sterling Forest State Park. It is also the location of Orange County Choppers, the custom motorcycle shop featured on The Discovery Channel television series American Chopper. United States, leader of the American Revolutionary War, from April 1782 until August 1783. William Seward, U.S. Secretary of State. Tony Gilroy, writer, producer, director. Tim Hummel, former major league baseball player for the Cincinnati Reds. Dee Brown, former Major League Baseball and Nippon Professional Baseball player. Rob Bell, former Major League Baseball pitcher. Dave Telgheder, former MLB pitcher for the New York Mets and the Oakland Athletics. General David Petraeus, Retired four-star general of the U.S. Army. Former Director of the C.I.A. and commander of U.S. forces in Iraq. Mel Gibson, attended school in Washingtonville the year before his family moved to Australia in the 1960s. Tomás Estrada Palma, first President of Cuba, lived in a home on Route 32 in Central Valley. Aaron Teitelbaum, current Grand Rabbi of Kiryas Joel faction of Satmar Hasidic community. Delano-Hitch Stadium in Newburgh has played host to various professional and amateur teams from various leagues since opening in 1926. The most recent professional team to play their home games at Delano-Hitch Stadium was the Newburgh Black Diamonds. High schools in Orange County compete in Section 9 of the New York State Public High School Athletic Association along with schools from Dutchess, Ulster, and Sullivan counties. The Army Black Knights of the United States Military Academy in West Point field NCAA Division I teams in 24 different sports. The Orange County Community College Colts compete in the National Junior College Athletic Association. Mount Saint Mary College in Newburgh fields 15 teams in the Eastern College Athletic Conference and the Skyline Conference of NCAA Division III. The Orange County Youth Football League (O.C.Y.F.L.) is a American football. The League encompasses 15 towns with over 100 teams in Orange County and surrounding areas including Chester, Cornwall, Goshen, Highland Falls, Marlboro, Middletown, Minisink Valley, Monticello, Newburgh, New Windsor, Pine Bush, Port Jervis, Valley Central, Wallkill, Warwick and Washingtonville. It is composed of 4 Divisions, divided by weight restrictions, and a "Mighty Mite" Flag Football division for 6 & 7 year olds. In each division, there is additionally a complete cheerleading program for each team. There is a comprehensive annual schedule of play within each division for all teams, culminating in a divisional Championship game, often played in Michie Stadium or Shea Stadium at the historic United States Military Academy at West Point, New York. ^ "Language Map Data Center". Mla.org. 2013-04-03. Retrieved 8 July 2013. ^ O'Grady, Jim (12 September 2011). "MTA Readies to Spend Millions on Damaged Port Jervis Line". WNYC. Retrieved 8 July 2013. ^ "Pre-Storm Train Service Resumes on the Port Jervis Line!". mta.info. 2012-01-15. Retrieved 8 July 2013. ^ Bolcer, Julie (7 November 2013). "Gay Congressional Winner Makes History in New York". Advocate.com. Retrieved 8 July 2013. ^ Rothman, =Robin A.; Tomcho, Sandy (9 April 2007). Sopranos' hits the Hudson Valley again"'". Times Herald-Record. Retrieved 8 July 2013. ^ Lussier, Germain (13 April 2008). "State budget brings films back to N.Y.". Times Herald-Record. Retrieved 8 July 2013. ^ "Washington's Headquarters State Historic Site". New York State Parks Department. 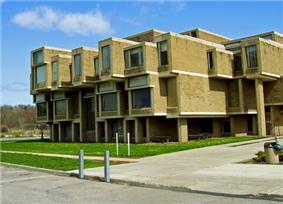 ^ "Survey of Historic Sites and Buildings. Washington's Headquarters (Hasbrouck House)". National Park Service. Retrieved 10 October 2012. ^ Glyndon G. Van Deusen, "The Life and Career of William Henry Seward 1801-1872"
^ "Biographies of the Secretaries of State: William Henry Seward". U.S. Dept. of State, Office of the Historian. Retrieved 10 October 2012. ^ Genovese, Peter (January 2012). "Hidden New Jersey: Greenwood Lake". The Star-Ledger. Retrieved 3 October 2012. ^ "Tiedemann Castle". dupontcastle.com. Retrieved 3 October 2012. ^ "Joe Nathan". Baseball-Reference.com. Retrieved 3 October 2012. ^ "Dee Brown". Baseball-Reference.com. Retrieved 3 October 2012. ^ "Rob Bell". Baseball-Reference.com. Retrieved 3 October 2012. ^ "Dave Telgheder". Baseball-Reference.com. Retrieved 3 October 2012. ^ "David H. Petraeus". Central Intelligence Agency. Retrieved 4 October 2012.